A student recently asked if it is okay to be attached to their practice. I found myself reflecting on this as a teacher. Am I attached to my practice? Certainly. And is it that okay? I believe the answer is yes. We become attached to practice in the same way that we are attached to anything necessary for our survival and this can be either healthy or unhealthy. Just as we can sleep too much or too little and habitually eat the wrong things we can treat practice obsessively or not engage with it enough. Developing a fruitful and balanced relationship is the goal. 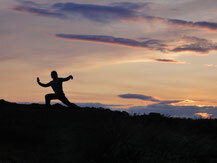 Training prepares us for practice, and teaches the skills and self-discipline necessary to integrate it into life. Practice is similar to food in that it provides nutrition for our growth and development. Every day the body is hungry for fresh energy and attention in order to survive and be comfortable. At the most fundamental level, practice should include some element of listening to the body, mind and emotions on a daily basis. This allows us to ascertain what we need, and prescribe our practice accordingly. Like our intake of food, practice must therefore be flexible. It cannot be decided and judged by the mind but by the arising conditions of life. It must be able to work with and respond to the seasons, the local weather and diet, the pace and requirements of work and committments and the maintenance of a good state of health. This is different for each individual and dependent on many factors including genetics, pre-birth qi, geographical location and early/current lifestyle. When we choose the path of traditional kung fu, or any discipline, practice becomes the keystone of one’s existence and this relationship is reflected in daily life. If we are rigid and hard on ourselves then life becomes difficult. If one is be focused and gentle and listens to the body then life is tender in return. Practice eventually becomes a place of rest, enjoyment and time of communion with the inner and outer dao. The only real requirements are willingness, consistency and love. If we truly love practice, willingness and consistency come without effort. But if we can love the self and devote time and patience to all elements of it; practice itself becomes effortless.